(Nanowerk News) Scientists who have developed a new way to create a type of radiation known as Terahertz (THz) or T-rays - the technology behind full-body security scanners - say their new, stronger and more efficient continuous wave T-rays could be used to make better medical scanning gadgets and may one day lead to innovations similar to the "tricorder" scanner used in Star Trek. In a study published recently in Nature Photonics ("Greatly enhanced continuous-wave terahertz emission by nano-electrodes in a photoconductive photomixer"), researchers from the Institute of Materials Research and Engineering (IMRE), a research institute of the Agency for Science, Technology and Research (A*STAR) in Singapore and Imperial College London in the UK have made T-rays into a much stronger directional beam than was previously thought possible and have efficiently produced T-rays at room-temperature conditions. This breakthrough allows future T-ray systems to be smaller, more portable, easier to operate, and much cheaper. Optical microscope picture of an antenna structure with the nano-antennas built into its centre (highlighted, top left) and the electric field distribution (top right). Bottom: An optical microscope image showing the unique nano-antennas and their effect on the THz waves generated. The scientists say that the T-ray scanner and detector could provide part of the functionality of a Star Trek-like medical "tricorder" - a portable sensing, computing and data communications device - since the waves are capable of detecting biological phenomena such as increased blood flow around tumorous growths. Future scanners could also perform fast wireless data communication to transfer a high volume of information on the measurements it makes. T-rays are waves in the far infrared part of the electromagnetic spectrum that have a wavelength hundreds of times longer than visible light. Such waves are already in use in airport security scanners, prototype medical scanning devices and in spectroscopy systems for materials analysis. T-rays can sense molecules such as those present in cancerous tumours and living DNA as every molecule has its unique signature in the THz range. T-rays can also be used to detect explosives or drugs, in gas pollution monitoring or non-destructive testing of semiconductor integrated circuit chips. However, the current continuous wave T-rays need to be created under very low temperatures with high energy consumption. Existing medical T-ray imaging devices have only low output power and are very expensive. In the new technique, the researchers demonstrated that it is possible to produce a strong beam of T-rays by shining light of differing wavelengths on a pair of electrodes - two pointed strips of metal separated by a 100 nanometre gap on top of a semiconductor wafer. 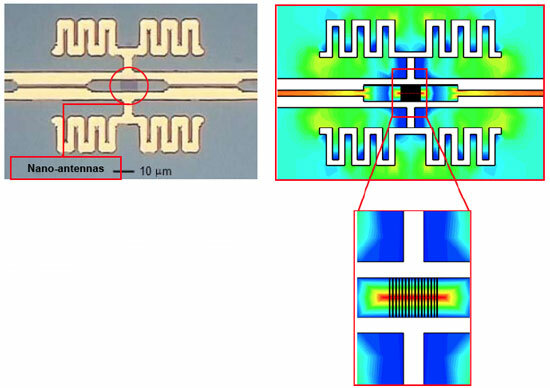 The unique tip-to-tip nano-sized gap electrode structure greatly enhances the THz field and acts like a nano-antenna that amplifies the THz wave generated. The waves are produced by an interaction between the electromagnetic waves of the light pulses and a powerful current passing between the semiconductor electrodes from the carriers generated in the underlying semiconductor. The scientists are able to tune the wavelength of the T-rays to create a beam that is useable in the scanning technology. Lead author Dr Jing Hua Teng, from A*STAR's IMRE, said: "The secret behind the innovation lies in the new nano-antenna that we had developed and integrated into the semiconductor chip." Arrays of these nano-antennas create much stronger THz fields that generate a power output that is 100 times higher than the power output of commonly used THz sources that have conventional interdigitated antenna structures. A stronger T-ray source renders the T-ray imaging devices more power and higher resolution. Research co-author Stefan Maier, a Visiting Scientist at A*STAR's IMRE and Professor in the Department of Physics at Imperial College London, said: "T-rays promise to revolutionise medical scanning to make it faster and more convenient, potentially relieving patients from the inconvenience of complicated diagnostic procedures and the stress of waiting for accurate results. Thanks to modern nanotechnology and nanofabrication, we have made a real breakthrough in the generation of T-rays that takes us a step closer to these new scanning devices. With the introduction of a gap of only 0.1 micrometers into the electrodes, we have been able to make amplified waves at the key wavelength of 1000 micrometers that can be used in such real world applications." The research was led by scientists from A*STAR's IMRE and Imperial College London, and involved partners from A*STAR Institute for Infocomm Research (I2R) and the National University of Singapore. The research is funded under A*STAR's Metamaterials Programme and the THz Programme, as well as the Leverhume Trust and the Engineering and Physical Sciences Research Council (EPSRC) in the UK.